Leftover Rice: Chocolate Peanut Butter Mug Cake for One recipe. You have probably seen enough of these one serve cakes by now. Haven’t you?. See that Leftover Rice: Chocolate Peanut Butter Mug Cake for One up above? Well I made that because I just needed something sweet. I did. I had to have something sweet and I did’t want a whole cake hanging around….warm and gooey and wanting to be eaten I wanted just one serve and I wanted it to be quick. One of my most popular posts was a cake that I made with left over rice and some chocolate. The idea came from the classic Orange and Almond cake you make with boiled oranges, only I didn’t have any oranges so I used leftover rice. I mixed the original in the food processor. It’s an easy gluten free cake and it was even featured in a Guardian Newspaper article at one point the Guardian on how to use left over rice. I had left over rice. The thing is if you want a one serve cake you don’t want to use the food processor so I made it without just by mixing it in a mug or a bowl. The first 3 times , the recipe improved each time it was made. The last two times were just to be certain. It’s really nice. And then I made the exact same thing in a Mug, just in case you don’t have a small bowl. So that’s 6 times…….. Luckily it only takes all of 5 minutes from start to chocolatey finish. Aww, so I ate more than just the one I was planning. I figured you can make it by just running your knife over the cold rice pieces to break them up a bit before mixing together all the other ingredients in a mug or small bowl and popping in the microwave. It’s chocolate and it will definitely satisfy your dessert cravings. Yes it has sugar, but I don’t care! First I did a quick chop of the grains. I gave it a really good stir. You can also do this easily in a mug. Then I gave it about 40 seconds in the microwave. Use that Leftover Rice for a chocolate heaven dessert for one. Use any nut butter you like and also chopped nuts if you like them. In 5 minutes you can be eating have this chocolate and peanut pudding . Make it with some kind of sugar substitute if you like. Make it in a mug or a small bowl. i liked the mug the best. Run a knife through the rice grains to break them up a bit before tipping into your mug. Pop into a microwave ( mine is 1200 Watts) for a minute for a nice sticky pudding. Don't cook any longer than 40 seconds for a powerful microwave. Oh I love one person cake/mug recipes! Sounds lovely with the peanut butter and cocoa. You’re very clever. Oh thanks Nancy. I love them too. Can’t wait to try this one, I’m always wanting a little bit of something quick and sweet. Oh yeah. great hope you do Lenore. This sounds like a really great one! Wow – what an awesome way to use leftover rice. I too added a recipe about using leftover rice to the ‘Your Weekly Feed’ link up today…great minds think alike. 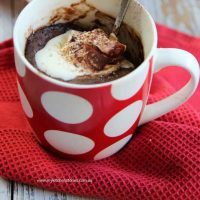 This is just genius – I love a good mug cake! I think this could be my new favourite way of upcycling leftover rice. As for all the recipe trialling, there’s no such thing as too much cake (in my opinion) so that’s a delicious perk of the job! Thanks Lorraine. It works quite well. i know cause I ate a lot of them! Oh stop!!!! This is incredibly dangerous!!!!! Ha.. get to it Lucy! Oh I just love the idea of a cake for 1 although I am yet to treat myself to 1 – how awesome is this recipe! Oh Jayne no…..come on surely you have made a cake for just you……? Aren’t you a bit clever. I’ve never actually made a mug cake yet but have promised my girls do make some on the weekend – they are quite excited about the idea! Such a clever idea with the leftover rice! I love it. I’ll have to try this for the kids, I reckon it’ll be a hit!!! Ha well it was just one of those recipes that come from need! Hi kari. You are a creative cooker too so thanks!